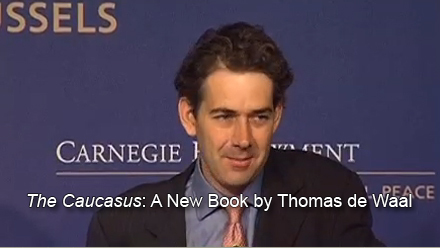 Thomas de Waal is one of the leading experts in the world today on the Caucasus, author of “Black Garden, Armenia and Azerbaijan Through Peace and War” and “The Caucasus: An Introduction” and a Senior Associate at the Carnegie Endowment for International Peace in Washington DC. He also knows all the key actors in the region for decades, including Leyla Yunus and her husband Arif, two of the most impressive intellectuals and human rights defenders in Europe today. The fact that both are in jail in the Azerbaijan of Ilham Aliyev tells you almost everything you need to know about this regime. Tom wrote the following essay as part of our advocacy effort to convince the European Parliament to give Leyla Yunus the 2014 Sakharov Prize. She is already among the top three, a huge honour and recognition of her work. The final decision will be taken later this week. In 1989 during some of the most tumultuous days of perestroika, Andrei Sakharov stood up in the Soviet Union’s first popularly elected parliament, the Congress of People’s Deputies, and called for the end of the monopoly on power of the Communist Party of the Soviet Union. Sakharov was an influential voice, but also a lonely one, speaking amidst a cacophony of old Communist Party nomenklatura officials on the one hand and aspiring nationalists on the other. At the same time, in the Soviet Union’s non-Russian republics, a few brave activists were inspired by the courage of Sakharov and others. They stepped forward and spoke out about the rights of their republics to win independence and achieve democracy. These activists were strongest in the three Baltic republics and the three republics of the South Caucasus: Armenia, Azerbaijan and Georgia. In Azerbaijan, the struggle was especially difficult. The Communist Party apparatus clung tenaciously to power. The Popular Front of Azerbaijan had a radical nationalist wing that was ready to use violence. All the while the mutually suicidal conflict with Armenia over the disputed region of Nagorny Karabakh was heating up. A small band of academics and intellectuals in the city of Baku were the first to talk about democracy, the first to warn about the dangers of “provocations” and the first to speak up about the defence of the Armenian minority still living in Azerbaijan. They combined courage with intellectual insight about where their republic was heading. Leyla Yunus, a young historian, was one of that band, together with her husband, Arif, also a historian and scholar. Yunus was one of the half-dozen founders of Azerbaijan’s Popular Front, an organization that modeled itself on the Popular Fronts of Estonia, Latvia and Lithuania, even as they knew how much harder the struggle was in their country. As 1989 unwound, Leyla and her colleagues warned that two extremes–the dinosaurs of the Communist nomenklatura and the nationalist radicals–were feeding off one another in a dangerous game of bluff and provocation. The sad culmination of these mutual provocations came in January 1990–Baku’s terrible “Black January” and the bloodiest episodes of Mikhail Gorbachev’s entire rule as Soviet leader. First the city’s remaining Armenians were subjected to pogroms and expulsion. Then Soviet tanks rolled in to the city, fired on apartment buildings and crushed demonstrators to death. At the end of Black January, around 90 Armenians were dead and thousands had fled, 130 Azerbaijanis had been killed. Leyla Yunus spoke up again, this time in print. In an essay entitled “The Degree of a Responsibility of a Politician,” published in the journal Istiklal in April 1990, she described the situation with devastating clarity. Forty five years ago, practically unarmed–how much the armament campaign of 1941 cost us!–our people stopped the tanks of brown Fascism. On the night of January 20, the armour of red Fascism went through the streets of Baku–the very same Fascism which had crushed and overpowered the peoples of the Union after October 1917. Until then, Leyla Yunus tells us, Azerbaijanis had been “lucky”–to a degree. Which of you, who threw away their Communist Party cards today, rejected the “Ruling and Guiding” Party in 1968 when our sons were sent to crush the Prague Spring? Which of you spoke out, when our boys were dispatched to Afghanistan? She rebukes the extreme nationalists of the Popular Front for fomenting hatred against Baku’s defenceless Armenians. And she warns against those who want to soak Azerbaijan’s movement for independence in blood. The responsibility of a politician is comparable to the responsibility of a doctor. In both cases lack of professionalism leads to death and injury. And if someone writes, “Sacrifice cleanses the nation! You know how much we needed this cleansing… ” it is absolutely clear to me where this patriot-politician can lead us. Why, in the name of a falsely understood unity of the nation should we march like a herd, behind first one, then another organization, behind this “father-leader” or behind another one? My greatest desire is to see the Popular Front of Azerbaijan as a single powerful organization speaking out from a position of democracy, defending with the help of lawyers today with human rights organizations everyone who has been arrested. I dream of an overwhelming victory by the democratic forces of the Azerbaijani people headed by the Popular Front of Azerbaijan in the elections. Our tree of freedom will not bloom soon, and we need to water it with reason and not with a pool of blood. Leyla Yunus’ essay was so powerful, clear-sighted and morally cogent that it persuaded hundreds of young Azerbaijanis to support the country’s Social Democratic Party, which became the most progressive and democratic part of the opposition. Leyla Yunus subsequently briefly served in the Popular Front government of 1992-3, where she was a moderating influence. In 1993 former Soviet leader Heidar Aliev returned to power as president of independent Azerbaijan. In 1996 she founded the Institute of Peace and Democracy. The list of issues they worked on was dizzying: rule of law, defence of those arrested, national minorities, land-mines. Later they founded Azerbaijan’s first women’s crisis center. In the mean time Arif Yunus was Azerbaijan’s foremost expert on a host of issues, including the plight of refugees and the rise of political Islam. In recent years, under the presidency of Heidar Aliev’s son Ilham, Leyla and her colleagues were increasingly targeted by the authorities. They were called strident, aggressive and difficult. And they were. In the past year, the situation in Azerbaijan has deteriorated rapidly. The old nomenklatura mindset is back in full force. The list of political prisoners Leyla Yunus compiled—now including her and Arif—has 98 names on it. Most of them are secular pro-Western activists. In April, Leyla and Arif Yunus were detained at the airport as they were about to board an international flight. They were hit with all sorts of ludicrous charges, most notably–and with the scariest echo of Soviet times– espionage on behalf of the enemy, the Armenians. In prison, Leyla Yunus, who has diabetes and other health problems, has been subjected to verbal and physical abuse. Arif Yunus, who has a heart condition, has been kept in complete isolation in the cells of the national security committee, the heir to the KGB. For her commitment to European values and human rights, Leyla Yunus was nominated for the 2014 Sakharov Prize in the European Parliament. Her condition and her heroism were recognized by four heirs of Sakharov: three dissidents who had worked with Sakharov, Sergei Kovalyov, Lyudmila Alexeeva and Svetlana Gannushkina and by Oleg Orlov, the head of Memorial. In the same week, the Russian Ministry of Justice applied to have Memorial–Russia’s strongest human-rights organization and the winner of the 2009 Sakharov Prize–shut down. In 1989 and 1990, these people had a vision, even as they recognized with the same clarity all the dangers that lay ahead, the narrow path that needed to be trod between different forces, if the former Soviet republics were to achieve European-style democracy. Now, unfortunately, 25 years later, in both Russia and Azerbaijan some of the worst fears are coming to pass. That increases our responsibility to support people like Leyla Yunus and Memorial, as they are punished for having that vision.